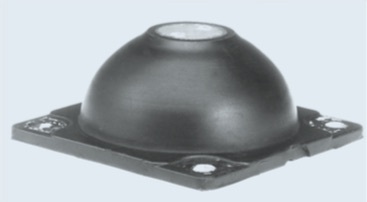 Mid-frequency, high deflection mounts for protection from severe vibration and shock. The TT-A mount is a mid frequency isolator which combines a low profile and large deflection capability in order to provide both shock and vibration protection. The TT-A is ideal for applications where high amplitude vibration inputs are expected or where large shock deflections are needed. Hi-Damp Silicone operating temperature range is -67°F to +300°F (-55°C to +150°C) and is resistant to fungus and ozone. Neoprene operating temperature range is -20°F to +180°F (-30°C to +82°C) and is resistant to oil and ozone. TRANSMISSIBILITY AT RESONANCE 10 Max. WEIGHT ME-100 = 0.2 oz.